–Daniel Brickley has been assigned to AHL-Ontario. He’s with the Reign for a two-game set in San Antonio and Cedar Park this weekend but is more likely to play tomorrow against the Stars than tonight against the Rampage. This is aligned more with an actual assignment to create space for a healed player – more on that shortly – than one of the recent paper transactions in which the Kings wringed out some additional cap flexibility by moving waiver-exempt players between Los Angeles and Ontario between games. Signed last spring to a contract as a free agent out of Minnesota State-Mankato, Brickley has two assists in five career NHL games and five points (2-3=5) in 21 games this season with the Reign. –More on the healing. “[Alec] Martinez hasn’t been out skating yet, but he’s progressing well. I think our medical team has done a great job getting guys back earlier than we planned,” Desjardins said. –Prior to their afternoon flight, Vegas lined up with forward groups of Marchessault-Karlsson-Smith, Pirri-Stastny-Tuch, Carrier-Eakin-Carpenter and Nosek-Bellemare-Reaves. 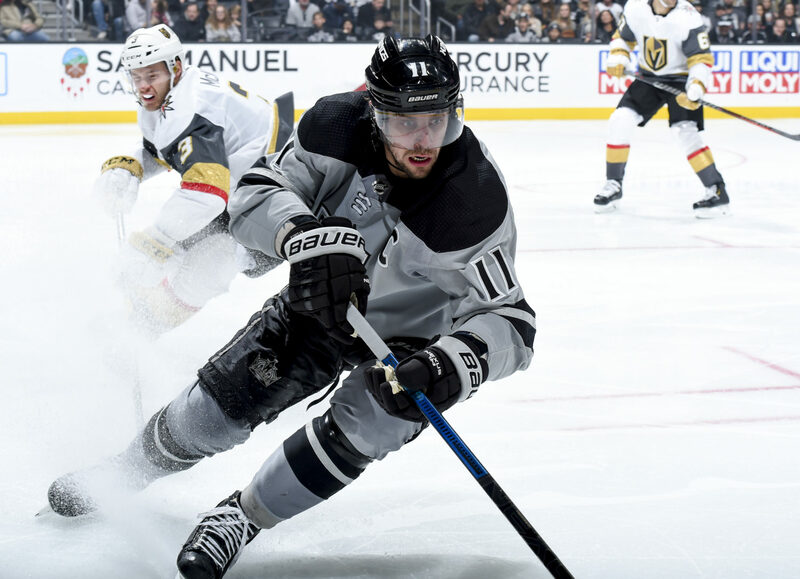 Per David Schoen of the Las Vegas Review-Journal, it’s unclear whether defenseman Colin Miller (undisclosed), who did not practice Friday, will play in the back-to-back set at Los Angeles and Arizona. The Golden Knights will be without Erik Haula (lower-body) and Max Pacioretty (lower-body), both of whom are on IR. “They’re going to be ready,” Desjardins said. “We beat them a couple times, so they’re going to have a pretty good focus and they’re going to come in here hungry. We have to make sure we’re on the top of our game. If we go in there relaxed at all, it’ll show early because they’re going to be hungry.” This two-game set that continues Sunday in Arizona will serve as the front end of Vegas’ fathers’ trip. –Speaking of Vegas, their go-go-go, jet-powered, turnover-forcing, puck pursuit-driven attack was a major reason why the Golden Knights finished second in the Western Conference with 272 goals last season. They’ve descended a bit towards earth despite having largely maintained good structure. Their pure, five-on-five possession rates rank fourth in the league, while their 1,990 total shot attempts rank second. But their team save percentage has dropped from .911 to .902, and with it a PDO that has shrunk to .981, the 28th mark in the league. Combined with injuries, Vegas has appeared to fall from Juggernaut into Still Awfully Good status. They’re 3-1-3 in their last seven games and are three points up on Anaheim for the third overall spot in the division, though the Ducks have a game in hand. Saturday’s matinee will be the third of four games over a 25-day span between the Pacific Division rivals. This swath of action has come during a period in which the Kings have strung together a fairly regular stretch of systems-heavy practices. Because of breaks in the schedule, Los Angeles took part in lengthy skates on December 17th, 19th, 21st and 28th, and have been able to work out some kinks in their game through regular repetition. Friday’s forechecking drill is among those to prepare the team well for what they should face again on Saturday. 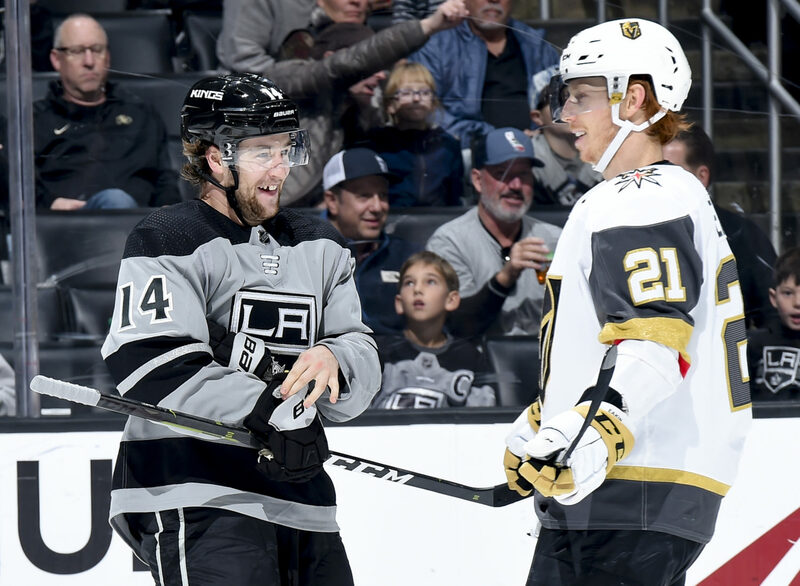 “You want to put pucks deep in spots where you can get ‘em back where you can kind of force them into your other forward, second forward and third forward, so you’re just trying to control the game as much as you can with where you’re putting the puck,” Leipsic said. –Los Angeles has allowed seven goals over their last four games and accentuated their recent lockdown trends by yielding only 34 five-on-five shot attempts to Arizona, their opponents’ lowest tally since October. The Coyotes generated very little from the center of the ice, and as many coaches will tell you, good checking and stout defensive play leads to chances at the other end. Nate Thompson credits the ability to close on players quickly and take away their time and space in limiting the opposition’s chances. Interconnected five-man units moving up and down the ice: the desired result in the marriage of work, detail, practice, structure and execution. I think you do notice a difference. It’s a lot more fun to come to the rink when you’re winning than when you’re losing. But I think saying that, that’s a time we’ll probably have to be harder on our guys. It’s easier to be hard on your guys when you’re winning. It kind of goes opposite – it’s better to be harder when you’re winning. We know we have to be better, but it’s sure nice to win some games. I like the line. I think the line’s carried us for a lot of the year. That was a big goal last night. It was a good shot. He’s had a lot of looks. That line’s been pretty consistent for us. He’s a real leader on the team. Like, he’s a guy that he went through a stretch a few years back but really found himself and his game. He’s great with the young guys, too. They’re on the road, and Brownie’s a guy that’ll take ‘em out and kind of mentor them and talk to them. His leadership’s big for our club. Yeah, I think so. I think I would like to create a little more, contribute a little bit more. I’ve been a little snakebitten. Had a good chance last night, but you know, there’s a fine line between making plays and not overdoing it too, so I think as a team we’re finding a good balance between when to make a play and when to put it deep and kind of fight their D and that sort of thing and that’s kind of the thing with me is just trying to find that happy medium of when to make the play, when to not make the play. It’s way better coming to the rink every day when you’re winning and you know the last little, couple games, we don’t feel like we’re too out of it if we get too down or a bad bounce or something like that. We feel like we can, you know, we’re still right there, we can push back, so hopefully keep this momentum rolling tomorrow against another good test, Vegas again.